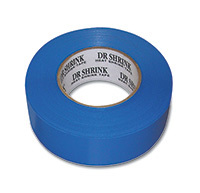 Shrink tape patches holes, tapes seams, and reinforces stress areas on shrink film. Shrink tape is designed to be used after the shrink film has already been shrunk. It may leave a residue if used on any other surface. Use blue shrink tape during fall and winter months for marine storage.